reaking New weather report! Lightning has struck!! Lightning has struck! Harry Potter is back. Ok! Let me start by saying I loved Harry Potter and the Deathly Hallows: Part 2 it is absolutely outstanding! My review will not do justice to the Epicness of most loved and successful British film franchise as it comes to an end. I feel that a review covering the entire series, highlighting the story arc and much loved characters would be more appropriate. But I think I covered some of this in my review of Harry Potter and the Deathly Hallows: Part 1 and in all honesty rather than read another glowing review you should be booking tickets for Harry Potter and the Deathly Hallows: Part 2 out this Friday. Harry Potter and the Deathly Hallows: Part 2 is a damn good case study for 3D. The 3D is absolutely gorgeous! This is the second film I have seen in as many weeks with outstanding 3D work. I still can’t talk about the other film, but the 3D may have even been a little better, because it did not have to deal with the innumerable CGI additions and that Harry Potter has. As with the other film there is minimal stuff popping out the screen it is mainly all about depth (behind the screen) layering and it works really well. The devil is in the detail and it’s the small things that make the difference especially when projected onto big screens. Small things like looking at a character’s face on screen and being able to distinguish the difference in depth of the tip of their nose, the glasses they are wearing, the eyes behind their glasses and even further to the background behind their head. I’m a fan of 3D and after the abysmal 2 to 3D post conversion attempts and toe dipping forays into 3D it seems filmmakers are developing some sort of decent standard, and it is all about depth. I should say that it is not 100% effective in Harry Potter but it is damn close. The main issue being that, for some reason, the 3D experts seem to employ a mild tilt shift effect to increase the depth of field. Which is fine if you if have a limited attention span but if like me you soak in the entire screen and all the glorious details while watching - it can be distracting because while the focus is on the foreground the background is almost completely blurred and vice versa. Apart from that clearly a lot of effort has been put into the making the 3D work and it pays off. It is a pleasure to be immersed in. I truly hope that 3D naysayers open their eyes when served up a nice big cup of “Shout the hell up!” By some of the excellent 3D releases coming up. Secondarily Harry Potter and the Deathly Hallows: Part 2 is good, it is so good in fact that it confirms my suspicions that Harry Potter and the Deathly Hallows: Part 1 was drawn out a “little” longer than it should have been. The word exploitative comes to mind. Swines. I’m renowned for my lengthy reviews which usually take longer to read than actually watching the film. But because Harry Potter and the Deathly Hallows: Part 2 is all kinds of good I’m going to try keep this short and sweet. Really you shouldn't bother reading it - rather use this time to go book tickets for a screening of Harry Potter and the Deathly Hallows: Part 2, which is out this Friday, as it is everything you want it to be and more, if like me you have not read the books. If you read my review of Harry Potter and the Deathly Hallows: Part 1 you will know that I have not been the biggest fan of the Harry Potter series, it always seemed to be on the wrong side it could be better, but with Harry Potter and the Deathly Hallows: Part 2 they have really pulled all the stops out to make it an awesome cinematic experience. It’s like watching all the latest Star Wars films rolled into one but actually enjoying them because they really live up to the expectation. Harry Potter and the Deathly Hallows: Part 2 picks up exactly where we left off with Part 1. 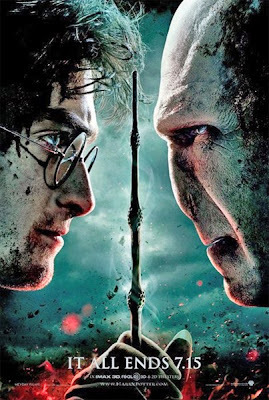 Except the tension has been turned up and increasing as Voldermort weakened by Team Harry destroying the Horcruxes, is becoming more unreasonable and dangerous lashing out indiscriminately at ally or foe alike. Harry, Ron and Hermione continue their quest to destroy the final Horcruxes before heading to Hogwarts which has been besieged by Voldermort and his army of darkness and are under increasingly violent attacks. What follows is an imaginative, action packed emotional journey and I’m not just referring to the exciting 5 minute in film advert for the Orlando Harry Potter roller coaster ride. Harry Potter and the Deathly Hallows: Part 2 feels a lot more well thought out and less disjointed than the previous films. Granted most of the film is all about action and moves at a pace that is exciting, yet takes you a long with it for the ride. The final Harry Potter film is EPIC, the best of the series and an outstanding film in its own right. If there is only one huge 3D summer film you see this year make sure it's Harry Potter and the Deathly Hallows: Part 2 you won’t be disappointed. Harry Potter and the Deathly Hallows: Part 2 will be in UK cinemas from tomorrow, Friday 15 July, 2011.